- PREPARE LEAVES ($15) - Cuts and bags leaves at HK and gives to transporter. - TRANSPORT LEAVES ($10) - Transports bag of leaves (already prepped). Usually assigned to a male greeter since it can be heavy at the start of first shift. - GIRLS OR ANY TRANSPORTER SHOULD HAVE A BAG OF LEAVES THAT ARE READY FOR WEAVING. WE SHOULD NOT BE USING NCL HNL TIME TO PREPARE THESE ITEMS! - PREPARE COCO ($15) - Cut, rinse, and bags fresh coconut pieces at HK. Usually assigned to the show lead since he does Coco Demo. Gives the mini cooler bag to the transporter at the end of the night. - TRANSPORT COCO ($10) - Transports cooler bag of freshly cut coconuts. Usually assigned to a female greeter that starts first shift at NCL HNL. - THEREFORE, THERE IS NO NEED FOR A KNIFE AT NCL HNL. IT IS NOT ALLOWED THERE AND COULD BE A COAST GUARD/SAFETY ISSUE. WE SHOULD NOT BE USING NCL HNL TIME TO PREPARE THESE ITEMS. - TRANSPORT NCL HNL ITEMS ($15) - Person assigned to this task on FRIDAY will be given a bag to bring to NCL. It is usually sent to DH via the driver or sometimes dropped off before the show ends. This bag(s) will be given to the Line Captain. February 15, 2017 Our Performance Management Team watching Mark Mauricio's Magic Show at Hale Koa. What an entertaining show!! March 15, 2017 Our Performance Management Team's first night at the Magic of Polynesia show. We have lots of work to do there. March 25, 2017 The Malu Cast enjoying a night out at Aiea Bowl. What a fun night! April 10, 2017 Our cast smiling with Hollywood stars Ryan Reynolds and Blake Lively after an intimate performance for their family. April 24, 2017 Aren't they adorable?! Some of our Keiki cast smiling at Hale Koa's special Military Keiki Luau event. April 25, 2017 Cassia, Elijah, and Kristen looking bright and FABULOUS as they lei greet and take photos with guests at the Nerium International event at the Royal Hawaiian Hotel. May 1, 2017 Our Malu Family showing LOVE and SUPPORT for DeAndre at his last show at Blue Note Hawaii before he moves to Australia to pursue his career! A HUI HOU DEANDRE!! You will be missed! May 1, 2017 It's always a fun night out when it's with the Malu Cast! Initially when you start you will be an INDEPENDENT CONTRACTOR. Contractor is NOT AN EMPLOYEE of Malu Productions, and thereby are not entitled to the benefits normally provided to employees, including, but not limited to; employment wages, medical insurance and /or participation in any pension or profit-sharing plan and any other benefit ordinarily afforded to an employee of Malu Productions. You shall be responsible for all of your own general excise taxes, payroll taxes, insurances and etc. As an independent contractor, you will be issued a form 1099-MISC and NOT a form W-2, Wage and Tax Statement. *Should you be interested in gaining full time employment with our company, please inquire with us after you have learned our shows and passed your evaluations. You will need to extend the number of days you work in order to meet the 35-40 hour/week minimum as well as pass an employee drug screening test. *Only use the 'Post-Deadline Availability Resubmission' Link if the Deadline has PASSED. OVERVIEW OF MALU PRODUCTIONS, INC. This form is specifically used to report an issue, discrepancy, typo, and/or incorrect information you found when reading through our Online Learning Modules (OLMs) or taking an online OLM quiz. Please fill out this form to the best of your ability so we may correct the issue ASAP. Resources for dancers, musicians, fire knife dancers, chanters, & emcees. All Diamond Head Audio, Lyrics, Training Videos, and Show Performance Videos can be found here. 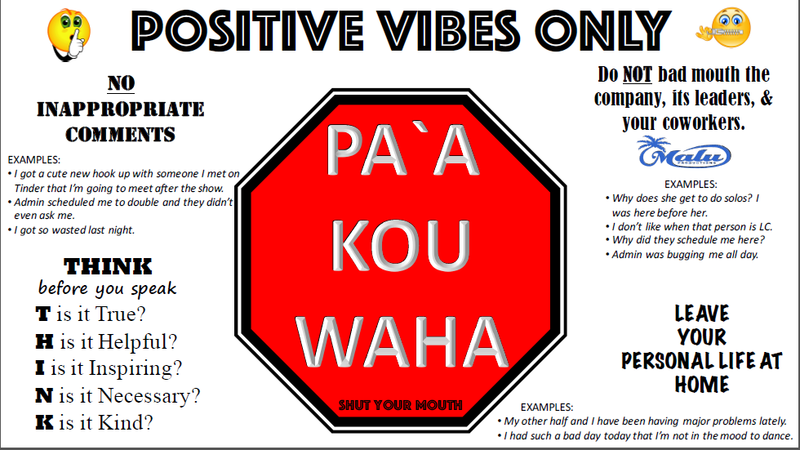 All Ka Moana Audio, Lyrics, Training Videos, and Show Performance Videos can be found here. All Hale Koa Audio, Lyrics, Training Videos, and Show Performance Videos can be found here. All Royal Hawaiian Center Audio, Lyrics, Training Videos, and Show Performance Videos can be found here. TI-LEAF SKIRT VIDEOS Videos showing how to make and pack a ti-leaf skirt. The entire evaluation process for new dancers in training can be found by clicking the link below. Late Night Training (LNT) Summary Form - This form is to be filled out if you completed a late night training session but were not an LC at any of our shows on the night of the LNT. There are many advantages of being a performer with Malu Productions. The following perks are only offered to performers that meet the specified qualifications. ASIDE FROM THE GUIDELINES STATED IN EACH LINK, YOU MUST BE IN GOOD STANDING WITH THE COMPANY TO BE ELIGIBLE.